Knowing our founder’s enthusiasm for anything that involves climbing a mountain, or riding a bike – in the urban jungle or off the beaten track in Scotland – it’s no surprise that Tengri fashion shows don’t usually involve comfy seats, a glass of champagne and air conditioning. That’s why the new capsule collection of knitwear, created with 100% Mongolian Khangai noble yarns, was unveiled in Mongolia during the Yak Festival, to coincide with the world-famous Nadaam festivals held every July. 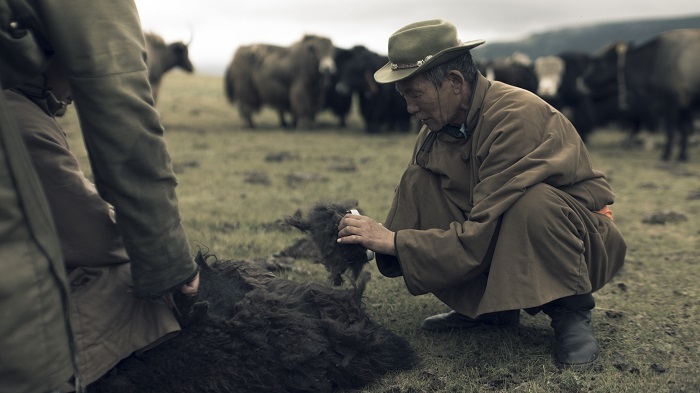 This new collection, following the ‘Warrior’ Collection of 2014, highlights the profound importance of the relationships between nomadic herders, animals and the land in Mongolia. 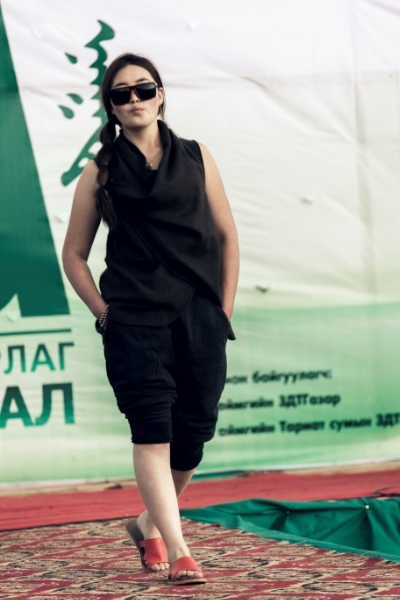 Joining an international cast of riders from Britain and America, the catwalk show featured Mongolian models scouted from local herder families in the run-up to the festival. Challenging weather conditions did not stop anyone from putting on a fantastic show and the local community enjoying it. Tengri models pose for a picture backstage with Nancy, Tengri founder (3rd from left) before the show. The show previewed pieces from Tengri’s new Autumn/Winter ‘Rider’ Collection, which will launch later this year. The capsule collection demonstrates simple classic cuts, which are utilitarian in style, unisex and easy to wear. Inspired by the spirit of the ‘Rider’ – evoking a sense of adventure and journeys to distant and unfamiliar terrain – it’s no surprise an expedition of fellow riders from Tumbleweedbikes rolled up on fatbikes and converged at this remote spot. American riders, Daniel, Jay and Aaron, were joined by British rider, Cass Gilbert, an avid cyclist, adventure-travel journalist and regular contributor to Sidetracked, Cranked, Mountain Flyer and Boneshaker magazines. Like us, these guys love the idea of an adventurous trek, new destinations, freedom of movement and the challenges offered by the trail. We even persuaded Aaron to model our collection. American cyclist, Aaron Glick, models items from Tengri everyday essentials. Designed by Nancy Johnston, Tengri’s founder, together with in-house designer Carlo Volpi, as well as textile and fashion students from Heriot-Watt university, the garments will be made in Scotland and London, where quality craftsmanship and technological innovation add new value to Mongolian Khangai noble yarns. 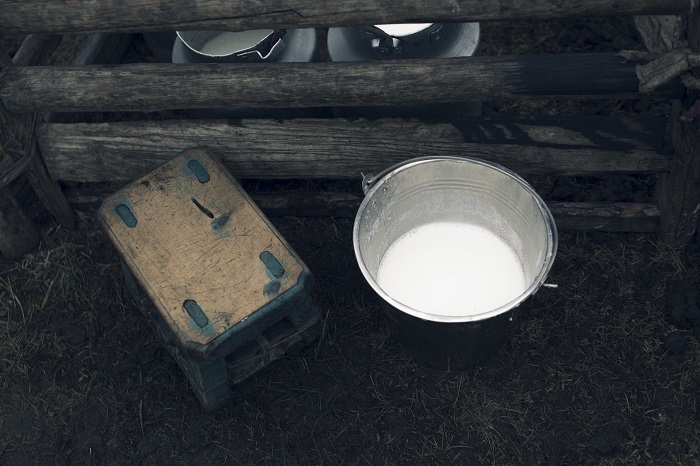 If you would like to discover more about Tengri yak fibre and textiles, come and meet us during the London Design Festival from 19 to 27 September. We will be showcasing the works of designers and artisanal makers who work with yak fibre, in collaboration with 19 Greek Street.